Amazing 3-day festival, Western Canada’s largest Latin festival that takes place each summer in August, at the Prince’s Island Park. Expo Latino Festival 2018 will be held on August 17, 18 & 19. All the information you need to know about the Festival. Check it out! Prince’s Island Park has a surface of 20 hectares and is linked by three bridges to Eau Claire and downtown Calgary and a north bridge to Memorial Drive and the community of Crescent Heights. It is part of the pathway and hiking trail system lining both sides of the Bow River. – Information by Wikipedia. We at Expo Latino have some expectations from our guests. We ask this so that we can have a successful event and be able to throw a great event year after year. It is not allowed to enter the festival ground with the following: animals (except guide-dogs), alcoholic drinks, spray cans, drugs, glass, cans, plastic bottles, weapons, sticks, walking sticks (medical crutches and devices excepted), banners, items with discriminating and/or provocative texts and/or expressions, blunt, stab or thrust weapons or firearms or other items that might be used as a weapon, items that might have a negative effect on the safety, health or wellbeing of the festival-goers, sprays, fireworks, liquids, torches and any other item which may be considered as dangerous by the organization. We want everyone to come out and have a great time, but there will be a zero tolerance towards any drugs or alcohol being brought onto the festival grounds. There will be security set up at the gate to search people prior to entering. Expo Latino Festival has a family friendly beer garden close to the stage. So, people can enjoy the music and dances, have a picnic on the grass, and have a drink if they want. No glass is allowed to be brought anywhere on site. It is prohibited to distribute flyers or posters during the festival! If you wish to promote one of your events, we offer the possibility to place an advertisement in the Expo Latino Program Guide, which is distributed amongst the visitors at the festival. There is no dress code at Expo Latino. 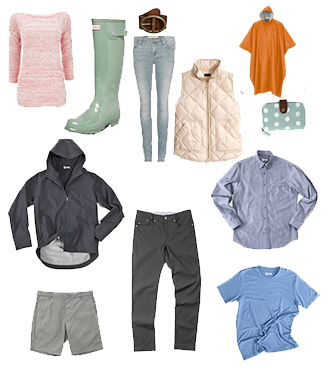 However, if you live in Calgary you know that the weather can be unpredictable, so we would advise you to dress accordingly. The average temperature in Calgary, AB in August is very mild at 15.7 °C (60.26 °F). 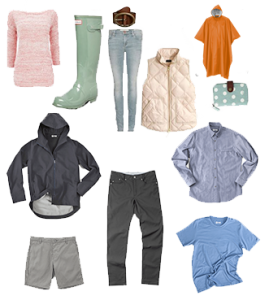 We recommend you to wear clothing that is comfortable and practical for the festival. Protect your face. Wear SPF. Music festivals are an exercise in preparedness, so if there’s even a chance of rain. Here are the answers to some of the questions we’re being asked. If you’ve got a question that you can’t find the answer to, then please contact us. The Festival occurs on Prince’s Island Park, 698 Eau Claire Ave SW, Calgary, AB. What are the dates and times for this year? You can view the Schedule page or current lineup. Available Soon! Sign up on our Volunteer page. You can send your submissions in via our Performer Submissions page. Can I bring a camera to the Festival and take photos? Festival patrons are welcome to take amateur photos. However, it is important that you respect other audience members and the artists by using discretion while shooting and photos must be for personal use only. If an artist has requested that no photos be taken of them, security or media volunteers may alert you. Non-professional cameras will be permitted. Please leave your DSLR or other detachable-lens camera at home. 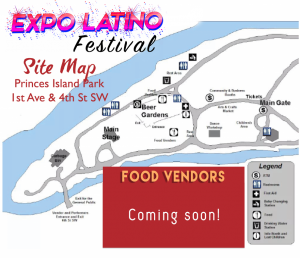 Only Expo Latino staff and authorized media partners and volunteers properly identified as such will be able to take professional photos that you can check out on our Flicker page. Is there an area to dance? There’s a dance floor in front of the mainstage so that you can get close to your favourite artists. I have a weekend pass, do I have in and out privileges? Once you have a wristband, you can come and go from the site. The wristband is good for the entire festival. Is there just music at the festival? Alongside the great music there’s a beer garden near the stage and dance area. There will be a variety of reasonably priced and delicious food on site for sale. Various Arts & Craft, Business and Community booths will be setup. Car pool, bike or walk to the site. There’s lots of inexpensive parking around the Eau Claire district ($2 evenings and weekends at the Eau Claire Market). As the festival is at Prince’s Island Park, it’s on bus routes. The Festival has secure bicycle parking on site. Can my pet dog, ferret or cat accompany me to the Festival? No pets are allowed on the festival grounds. Please leave them at home! Service dogs with appropriate accreditation are the only exception. I would like to setup with a booth, how do I apply? The Booth Categories are: Food, Business, Community and Arts & Craft. May I refund my ticket? Sorry, but tickets are non-refundable. The festival runs rain or shine! Treat your tickets like CASH. All sales are final. There are NO refunds, NO cancellations, NO credits, NO exchanges after the order has been made. When will I know when my favorite artists are playing? The Main Stage schedule is found at our Schedule Page. Coming Soon! We encourage you to buy tickets not just to go see one act, but to experience a full day or weekend of music, food and crafts. Drop us a line at info@expolatino.ca or call (403) 271-2744. With a prime location in the heart of the city, our all-suite downtown Calgary hotel offers easy access to Calgary’s best events and attractions. Whether you’re staying for business or pleasure, our luxurious, Four Diamond accommodations will make you feel right at home. Stunning views from our floor-to-ceiling guest room windows will inspire you to get out and explore. The Sheraton Suites Calgary Eau Claire is in walking distance to downtown Calgary shopping and dining, Prince’s Island Park, Bow River and more. The Sandman Hotel Calgary City Centre is delighted to host the guests of the Expo Latino Festval. The rates are quoted per room per night and are subject to taxes/fees. To note the rooms are subject to availability. Bookings can be made by calling 1-800-SANDMAN and quoting group number 889209.
International Hotel Suites Calgary is an urban escape for business and leisure travelers. Casual style meets modern convenience at the International with simple, yet elegant decor that inspires relaxation and rejuvenation. International guests connect to over 19 km of downtown shopping, nightlife, dining, recreation, cultural and corporate entities throughout the core. They are offering Expo Latino guests a special price of $119 + tax per night for festival nights. Guests can call in to the hotel directly at 403-265-9600 or email book@internationalhotel.ca to reserve their stay. Ideally situated in downtown Calgary, The Westin Calgary Hotel offers the best of the city at your doorstep. Packed with exciting attractions, activities, museums, beautiful parks, entertainment and sport venues there is never a shortage of things to do in Calgary. And after a day of exploring, retreat to one of the best downtown Calgary hotels where you can relax in our rooftop pool and sauna or take advantage of our WestinWORKOUT®, with its state-of-the-art equipment. Enjoy dinner at the hotel, at one of our three great Calgary restaurants which offer modern North American cuisine with a local accent. Then sink into your Heavenly Bed for restful night’s sleep. They will be offering Expo Latino 2018 guests a special rate of $149.00 + tax per night (Regular price $204.00) which will include complimentary wifi and parking. All guests shall make reservations through our Operator’s Central Reservation Office, at 1-888-627-8417 on an individual basis, identifying themselves as members of Expo Latino 2018 Room Block, whereby a special rate of $149 will be honored, based on availability (reference code # EH17AB). The Hispanic Arts Society has hosted Expo Latino for the past 22 years. It has come from a one-day event in Eau Claire Market with a handful of performers, to a three-day weekend extravaganza filled with exotic foods, an art market and World class performances. This year, the festival will be held in Prince’s Island Park from August 17th-19th, 2018! Every year the Program Guide is placed in several locations across Calgary. Expo Latino fans patiently await the arrival of the program guide so they can check the line-up of their favorite performers. Advertising in our program guide is a great way to reach over 40,000 people with information about your event, service or company. Click below for the 2018 Advertising Specs & Rates.